Initially there were twenty members including Christopher Bechtler and Rev J.M. Caldwell serving as Pastor, when they petitioned the Concord Presbytery to organize our church in 1834. The land was a gift from Mr. William Thompson, a Jewish immigrant and native of Russia. The location of the church has not changed since it's organization. The first building was rather unique. The two-story frame building fronted N. Washington Street as well as Academy Alley on the south side. The Academy and the Presbyterian Church co-owned the building until 1885. From 1877 to 1883, a second church buiding was constructed. This church was a white frame building with two doors and twelve windows of Gothic architecture facing N. Washington Street. Above each door was a steeple. This building was used for 70 years. A third and present church was completed in 1952. During construction on the same site, services were held in the Rutherfordton Elementary School. The subfloor of this new church is made from the lumber from the old church. The old bell hangs in the belfry. The building is of brick, with stained glass windows framed in Gothic shaped architecture. There are three outside entrances and three floors. The first floor (basement) contains a fellowship hall, five classrooms, a kitchen, and two restrooms. The second floor has a narthex, a sanctuary, ladies' parlor, mens' Bible classroom, two offices and two restrooms. The third floor has four classrooms. In 2001, an addition was contructed with handicapped restrooms, an elevator reaching all three levels, two offices, and a meeting room known as the Garden room. An area for a garden and columburium was established facing N. Washington Street exiting from the Garden Room. 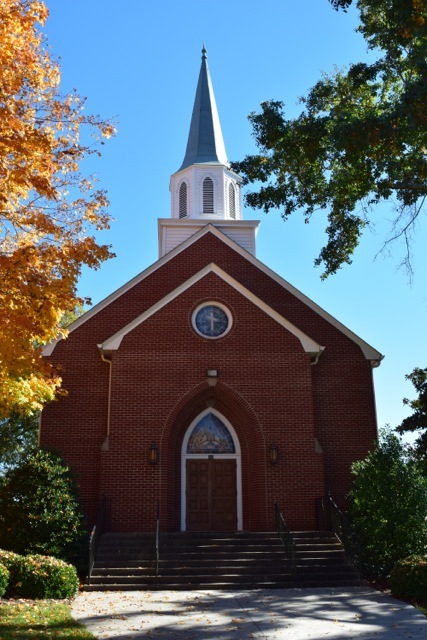 This story would not be complete if homage were not paid to Rutherfordton's mother church, Brittain. 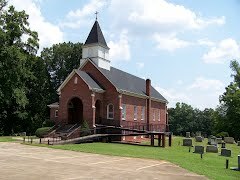 It is located a few miles northeast of Rutherfordton on US 64 and organized in 1768. This first church, Little Britain, already had a "Burying Ground" on the land and belonged to Great Britain. A large acreage was granted to Mr. William Long by King George III. Mr. Long then deeded seven acres to the Church. The name, Little Britain, was retained until after the Revoluntionary War, when, the Mecklenburg Presbytery authorized the addition of another "t" in the spelling to distinguish it from the mother country, Great Britain. Thus, the name - Brittain Presbyterian Church.